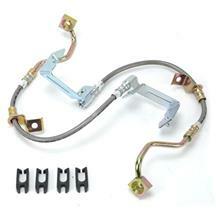 Use these 2005-2014 Mustang stainless steel brake hoses to improve brake system performance on your S197. Factory rubber lines can become worn, torn, and start to leak over time causing brake fade and decreased brake performance. These stainless steel brake hoses directly replace your factory 05-14 Mustang hoses and are made to resist corrosion, wear, and rips. 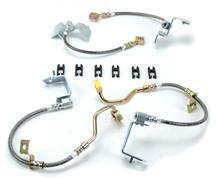 Pick up a set today to get your brake system working better than ever! These kits fit 2005, 2006, 2007, 2008, and 2009 Mustangs.